When you watch a classical kungfu set, you are watching the crystallization of some of the best combat movements masters used in the past in their real fighting. Most kungfu practitioners today do not realize this fact, and employ kungfu sets mainly for demonstration. In this series Sifu Anthony Korahais enacts this important fact, and demonstrates with Dr Damian Kissey some of the most beautiful attack and counter movements. The combat level shown here is high, and it needs much skill for its successful implementation. Sifu Anthony Korahais links the combat sequences he has worked out into a set. Notice that Sifu Anthony's forms are picture-perfect. Having picture-perfect forms, besides being a beauty to watch, gives a practitioner many combat advantages. Here Sifu Anthony continues the performance of the set he has just composed from his combat sequences he has earlier created. After this Special Shaolin Kungfu Course, every participant not only can compose their his kungfu sets, but also understands the philosophy of their compositions. A kungfu set is not meant to please spectators, though today many people practice kungfu sets mainly for that purpose. You can develop a lot of kungfu skills from set training, such as precision, stamina and fluidity. There are of course many other benefits. There are a few important considerations you should know when you next perform or observe a kungfu set. How are the patterns used for combat? Why are they arranged in their particular manner? What counters you can use if an opponent apply these patterns on you? In this course, Sifu Anthony is the only participant who chooses the Pakua Set as a specialty. Dr Damian's specialty is the Five-Animal Set, but he stands in as a Pakua sparring partner to help Sifu Anthony devise his combat sequences from bis specialized set. 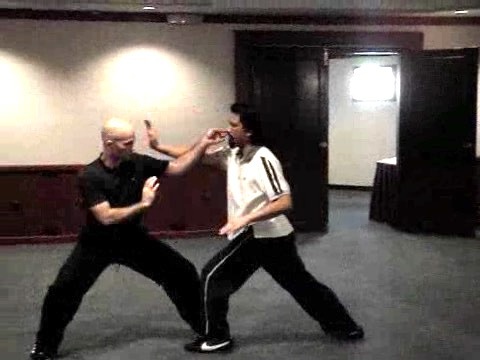 In this combat sequence, Sifu Anthony employs high-level tactics. He strikes his opponent as soon as the opponent attacks. Here both Dr Damian and Sifu Anthony employs high-level tactics, striking an opponent as soon as he attacks. A few secrets are also revealed. How would you defend against or counter an opponent who strikes you as soon as you attack? Right timing and right spacing are basic skills learnt at the start of our kungfu training. But they are also very important in high-level combat, as is evident in the video clip here. 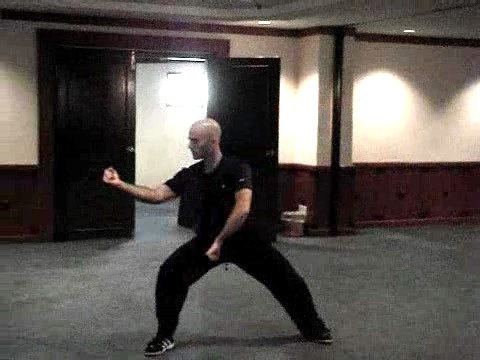 Many people think that kungfu patterns are too flowery, and cannot be used for real combat. This short video clip shows that such thinking is wrong. The patterns used by Sifu Anthony and Dr Damian are as beautiful to watch as effective for fighting. Crystallization of Combat Techniques from Past Masters from Wong Kiew Kit on Vimeo.